Corky: Man, this world is so sad these days, so many people hurting. I feel so helpless! I wish I could DO something to help those who are suffering! Sending money is fine, but sometimes I just wish there was something I could personally do. Corky: BUT, I don’t want to go all the way into Charlotte. I mean, I know there are plenty of hurting folks there, but have you seen the traffic lately?!? 74 is a mess, 485 is awful in the afternoons, plus trying to find parking downtown… no thank you. Corbin: Is Monroe close enough for you? Corky: Hmmm…. I guess so. But is there somewhere to park? Those one-way streets can be confusing and I refuse to parallel park! Corbin: Yes, there is a parking lot, and it’s super easy to get to. Corky: Well, in that case, I might be interested… But wait, I really don’t want to leave my kids/spouse/dog/cat/goldfish… Is this something only adults can do? Corbin: No, this is actually a great place to bring anyone! Even kids can come. I’m afraid you’d have to leave your pets home, though. Corky: Yeah, but will the kids just be in the way? Corbin: As a matter of fact, this is a great place to bring kids because they can actually help! Kids as young as 4 can usually be useful (as long as there aren’t too many of them!). Corky: Hmmmm… interesting. But is this one of those things where we’re not actually useful, and it’s more of a sightseeing trip for Christians to see how others live? 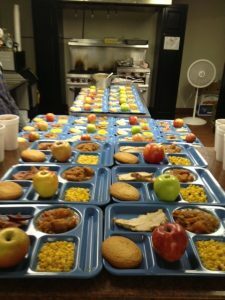 Corbin: No, you would actually meet a very basic need– literally serving dinner to those who might not otherwise eat. For some of them, this might be the only food they have that day. Corky: Is it one of those institutionalized dinners? I mean some of that large-crowd institutional food is just not food! There can’t possibly be any nutritional value to that slop. Plus I’m sure it’s all GMO and nowhere even close to organic. Why would I want to go give a bunch of chemicals and fillers? Corbin: Actually, we bring the food, and a lot of it can be homemade! You can even make the food in your own kitchen with your own non-GMO, organic ingredients if you want. Corky: Hold on, hold on… I’m not actually saying I want to cook. I don’t have the first idea how to make dinner for that many people! Corbin: You certainly do NOT have to cook. If you want to learn some new recipes, we do provide some that you can use, and it’s actually a good way to get the kids involved in the kitchen, physically working to make food for the hungry. But if you don’t have time to do that, you can help out in other ways. Corky: What other ways are there to help if I’m a terrible cook? Corbin: You can purchase items to serve – such as bread, canned or frozen vegetables, desserts, etc. Each month we provide a suggested menu and many of the items can be bought. Corky: Well, what if I don’t want to just send food? That feels too much like just sending money, which I didn’t want to do! Corbin: Then, you can help by coming to serve the food! Each time we serve dinner we need somewhere between 6 and 10 adults and/or kids to help prepare the trays. It’s a great time to work with others and get to know Redeemer folks even better! Corky: Yeah, but how long does it take? I mean, we have soccer practices, ballet rehearsals, basketball games, pottery classes, golf lessons, horseback riding, art classes, women’s Bible studies and men’s groups to work around! Corbin: It really doesn’t take long at all! The food is prepared ahead of time for the most part, so the actual serving at the shelter only takes about an hour. And it’s conveniently between 5:30 and 6:30, allowing you to get to all your evening activities/classes/studies/games/practices! Corky: How can that be? Doesn’t the clean-up alone take hours? I can’t stand washing dishes for longer than 5 minutes, much less hours. Corbin: There’s no clean-up involved at all! The shelter has that covered already. 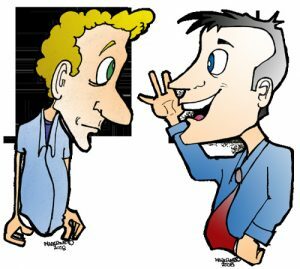 Corky: So let me get this straight: There is a way to help the homeless people in our own community without having to go far at all, at a place where we can bring our kids, and we can either cook, send store-bought food, or come to serve the food others have made? And it only takes an hour?? AND, we don’t have to do dishes?? I can’t think of any reasons NOT to do this! What is the name of this place? Corky: This would actually be GREAT for our Life Group to do together! Corky: OR, we could just sign up as individuals, right? Corky: I mean, this is RIGHT IN OUR BACKYARD! Corky: What a great, PRACTICAL way to be the hands and feet of Jesus right here in Union County! Corky: Why didn’t someone tell me about this earlier? Corky: Well, thanks for letting me know now, man. Let’s get the word out to the rest of the COR! This is a work of fiction. Any resemblance to actual COR members is purely coincidental. 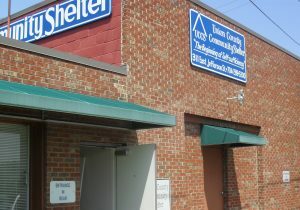 Click here if you wish to sign up to prepare or serve dinner at the Union County Community Shelter!